It's Tracey here to share an altered clock I created featuring gorgeous Leaky Shed Studio chipboard. This is a gift for a sweet friend who will be getting married in June. Her grandparents were an important part of her life. 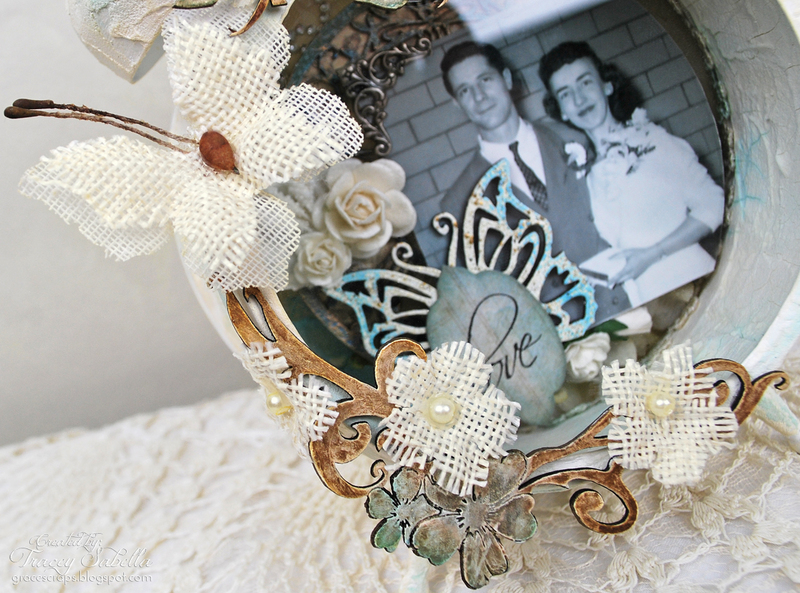 She wanted a special memento to display representing their presence on her wedding day. Here's a photo of the inside of the clock. 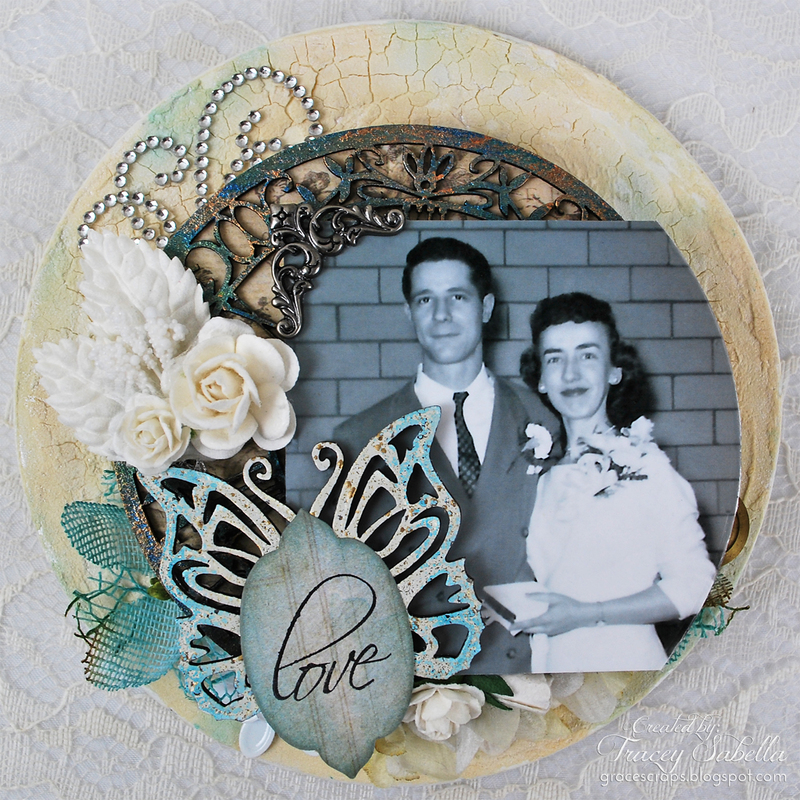 I adhered the photo and elements to the back panel which I had gessoed, covered with crackle paste, then colored with Lindy's Stamp Gang mists. 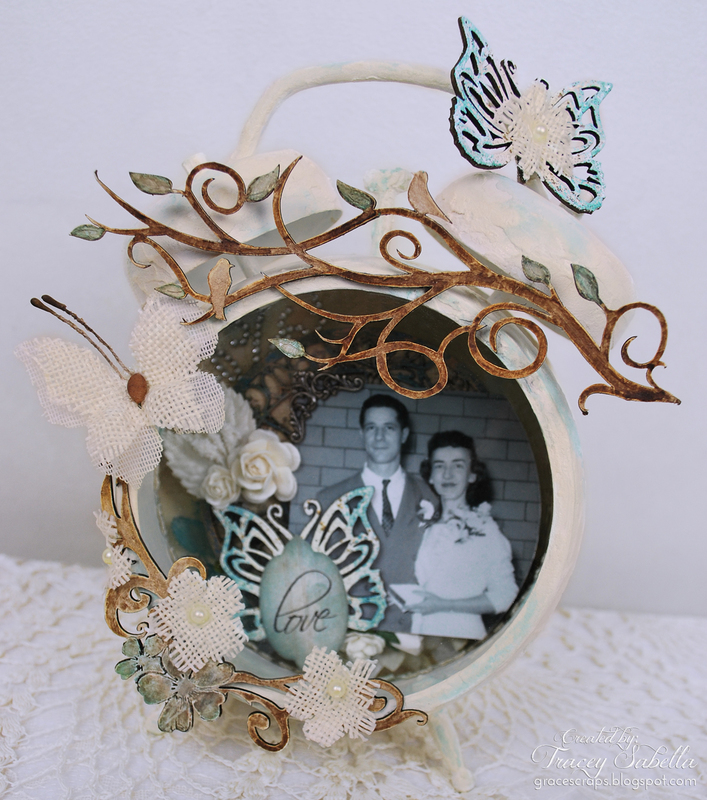 I've used the gorgeous Clock #2 (small) behind Mandy's grandparent's photo. I had extra teal mist in my craft mat and rubbed the clock across the splattered mist to color. When the mist was dry, I rubbed with several colors of metallic paint in teal and gold. The Leaky Shed Spring Butterfly (small) comes with three sweet butterflies per set. I've heat embossed this one with Fran-tage Aged Ivory embossing enamel, then lightly on the edges with Iced Enamels turquoise Relique (embossing) Powder. 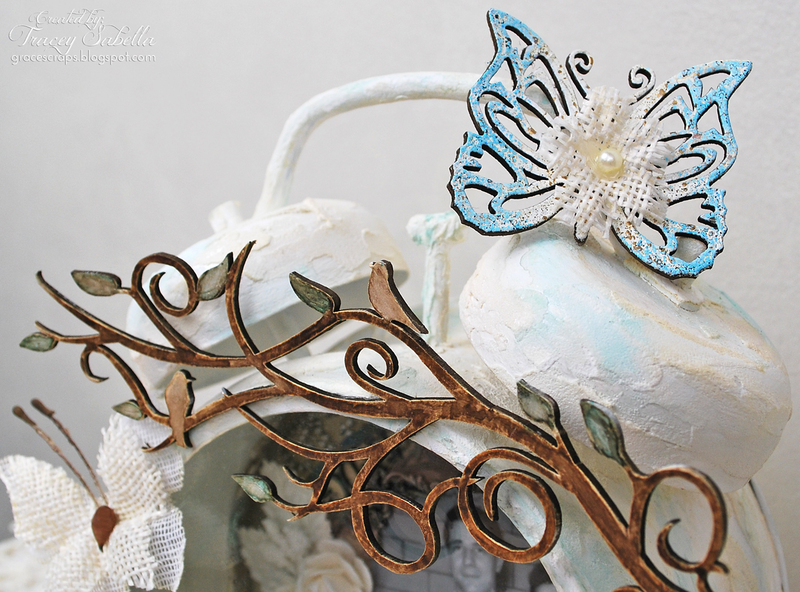 I stamped and die cut the love sentiment layered as the butterfly body. Don't Mandy's grandparents look so happy and in love? 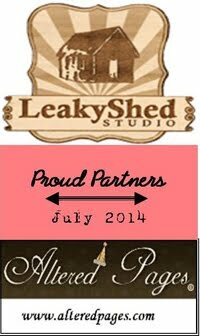 I trimmed down the Leaky Shed Studio Harja Flower Eins flourish and colored it with Lindy's Stamp Gang mists. Layering once color over another results in the color variations seen on the flowers. I adhered several burlap flowers around the flourish since Mandy's using burlap in her wedding decor. The clock was painted with several coats of gesso then using a palette knife to apply crackle past to the surfaces of the clock. Here I was looking for a peeling paint effect. I brushed with watered down mists to color. The natural topper for this sweet clock would have been a heart flourish, however, one of Mandy's favorite childhood memories with her grandmother was counting birds, so I just had to use this charming Leaky Shed Studio Bird Branch chippboard. 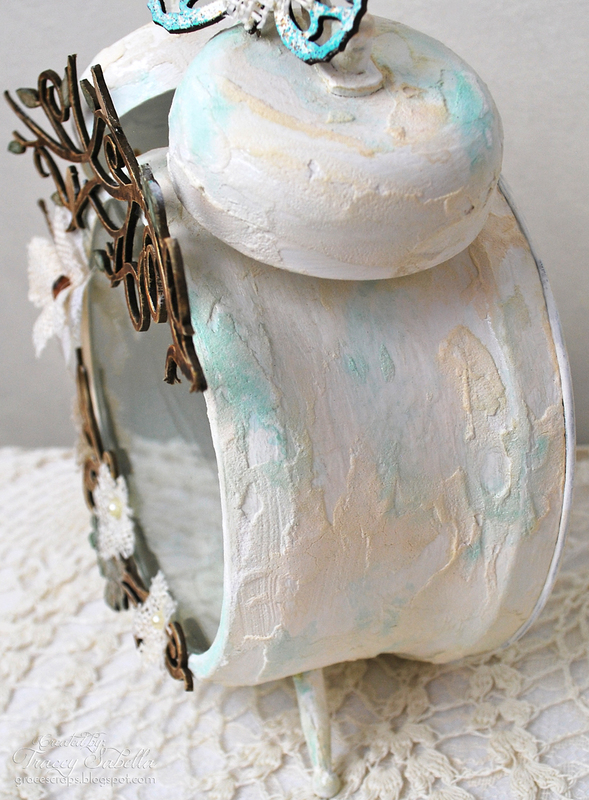 I've painted the piece with white gesso, then brushed on several shades of Lindy's mists to color. 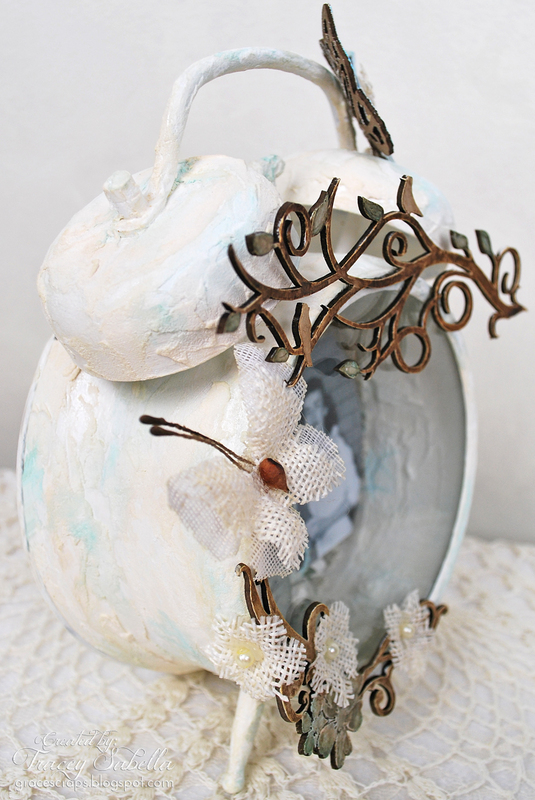 The butterfly is created just like the one previously described, then centered with another of the tiny burlap flowers. Here's a side-view giving you another angle of these sweet chipboard pieces!! on your next altered project! Please stop by my blog Friday for a complete product list HERE. Tracey, this is a beautiful project.